An experience everyone craves. 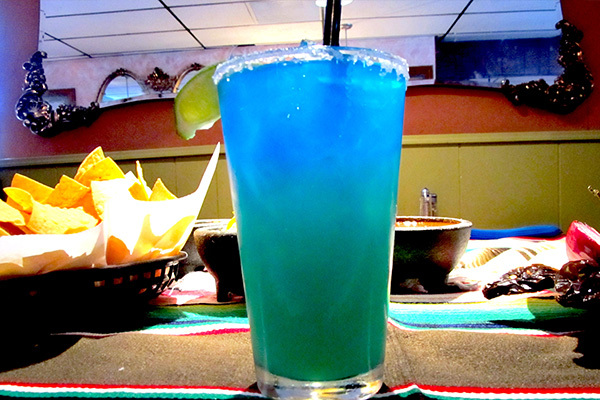 We use 100% Agave Tequila… Sauza Hornitos in this Margarita. Served with a splash of Cranberry and Grand Marnier. Premium Jose Cuervo Tequila. Blue Curacao and Grand Marnier are the key ingredients that make this BlueMoon Shine. Discover the Margarita masterpiece, made with Sauza Gold & Grand Marnier. A refreshing blend of Midori Melon Liqueur, Grand Marnier, Cuervo Gold Tequila and Sweet & Sour. Our world class Margarita made with style. 100% Blue Agave Blanco Tequila, lime and Grand Marnier float. A potent classic. Mixed tropical juices and two types of rum…really tasty. A popular eye-opener made with Tequila Gold, orange juice, topped with a splash of grenadine. Beware! Too much of this tea and you will be shipwrecked. Rum base and various exotic juices blended to perfection. Choice of fresh Bananas, Strawberries, Melon, Raspberry, or Peach. Ripe California avocados with just the right seasoning and a touch of lemon juice. A special recipe using our famous refried beans and special sauces for one outrageous south of the border taste. Grilled steak on a bed of lettuce, tomatoes, cheese, tortilla strips, and choice of sliced avocado or guacamole. Grilled shrimp on a bed of lettuce, tomatoes, cheese, tortilla strips, and choice of sliced avocado or guacamole. grilled zuchini, carrots, caramelized onions, bell pepper on a bed of lettuce, tomatoes, cheese, tortilla strips, sliced avacado or guacamole. *Choice of Ranch, Creamy Ranch Cilantro or Chipotle dressing. Grilled chicken on a bed of lettuce, tomatoes, cheese, tortilla strips, and choice of sliced avocado or guacamole. 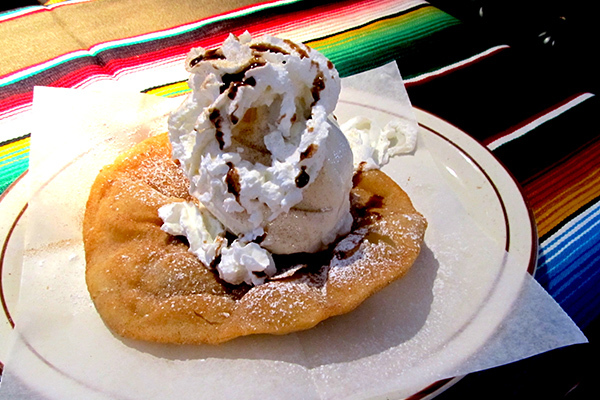 A large crisp flour shell filled with refried beans and Shrimp. Topped with lettuce, tomatoes, cheese, guacamole and sour cream. A large crisp flour shell filled with refried beans and Carnitas. Topped with lettuce, tomatoes, cheese guacamole and sour cream. A large crisp flour shell filled with refried beans. Topped with lettuce, tomatoes, cheese, grilled zuchinni, carrots, caramelized onions, bell pepper, guacamole and sour cream. Our very own recipe of Steak Colorado, fresh “Frijoles de la Olla” (whole beans) and mild Chile sauce. Served with homemade flour tortillas…an old time traditional favorite. Steak Colorado and Chile Verde combined in a large bowl with authentic seasoning served with homemade flour tortillas. Chicken breast and Spanish rice in a rich traditional tomato broth topped with a dash of pico de gallo and lemon served with fresh homemade tortillas. Succulent Chile Verde pork and Spanish rice in a rich traditional tomato broth topped with a dash of pico de gallo and lemon served with fresh homemade tortillas. Six large Tiger Shrimp, Spanish rice, carrots, zucchini, mushrooms and pico de gallo. Served in a traditional tomato broth with fresh tortillas. A beef steak cut in thin slices with a delicious red sauce. Chunks of lean pork sautéed with tomatillos, onions, green Chile and a touch of garlic served in a mild tomatillo salsa. Tender marinated pork roasted with authentic spices and fresh orange slices. Served with guacamole, pico de gallo and lemon wedges. Thinly sliced top sirloin perfectly seasoned and grilled with onions to perfection. Served with guacamole and pico de gallo. Four crispy rolled corn tortillas stuffed with your choice of shredded steak or chicken and topped with melted cheese served with guacamole and sour cream. A traditional Mexican favorite dish of steamed cornmeal and your choice of beef or pork wrapped in a corn husk. Steak slices cooked with potatoes, bell peppers simmering in our own special ranchero sauce. Large Tiger Shrimp grilled with bell peppers, mushrooms, onions, carrots and zucchini. Served with guacamole, sour cream and pico de gallo. Sauteed Shrimp on creamy garlic sauce. Two crispy tacos with shrimp topped with lettuce, tomatoes, cheese and pico de gallo. Beef Taco, Suiza Chicken Enchilada $13. All combos are served with Spanish rice, refried beans, green salad and homemade flour tortillas. Our mouth-watering Carnitas wrapped inside a large tortilla smothered with cheese and our delicious red sauce. Served with guacamole and sour cream. Your choice of Chile Colorado, Chile Verde, Carnitas or chicken wrapped inside a large tortilla smothered with cheese and our delicious green sauce. Served with guacamole and sour cream. Large flour tortilla with sliced marinated carne asada, with grilled onions and cheese. Served with guacamole, sour cream and smothered in a delicious red sauce. Sautéed large grilled Tiger Shrimp and Spanish rice inside a flour tortilla. Wrapped and topped with melted cheese. Served with guacamole and sour cream. **Two item lunch special and lunch combos not available after 3.00 p.m.
**Two item lunch special and lunch combos not available after 3.00 p.m. ***One item special 9.50 after 3:00 p.m.
Tender marinated roasted pork served with guacamole and pico de gallo. No checks accepted. We accept VISA, MasterCard, and American Express. For parties of eight or more, a 18% gratuity may be added to the total bill. No separate checks. Kico’s is not responsible for lost or stolen articles.